TRIVIA of Noh : Q86 : Why go to su-utai? | Home | Trivia | Q86 : Why go to su-utai? Even if you go to Noh a lot, it is often not easy to make out what the actors are saying. This is a barrier for many people. You may find it difficult to understand the story while listening to words in a fixed verse form that describe ancient events not related to the present day. When accompanied by the strong pounding of drums, the words are sometimes almost inaudible. 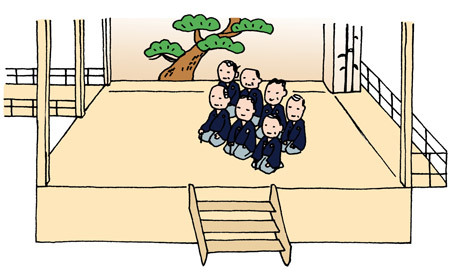 Understanding the meaning of Noh chants, however, makes watching plays twice as interesting. If you wish to understand the story by listening to the words, you might like to attend su-utai (a Noh performance without music or dance). Here, you can get a feel for the tone, rhythm and intonation of chanting. Actors play parts in su-utai as in normal performances. This includes not only the leading, accompanying, supporting actors and chorus, but sometimes even accompanying Kyōgen actors. There is no dance part; actors chant sitting side by side in the middle of the stage, just opposite the near left pillar. Because they do not wear masks, their voices are clearer than during normal performances, and you do not have to feel it against etiquette to read librettos to follow the story. Like a poetry reading session, you can concentrate on the storylines while enjoying the rhythm and dynamism of the words. Another point to appreciate is that you share the actors' understanding and interpretation of the play. Su-utai is not often performed by professional actors but is more common at free amateur events, so you can casually enjoy their performances without worrying about the expense.